Most business owners think that to create explosive growth they must make massive changes – explosive growth has to come from combustive action, right? In reality, if you can leverage the force of optimization and maximization, you can learn how small, incremental improvements in certain areas of the company that are lacking can result in geometric growth for the entire company. As a business owner, at any given moment, a million things can be competing for your attention. And it’s easy to put your focus on finding innovative ways to stand out, developing creative solutions to industry challenges or trying to find new means of generating income. 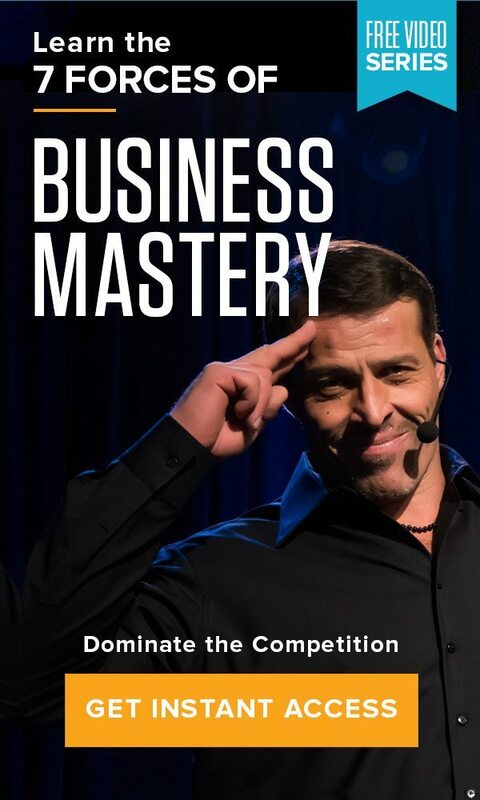 But constant optimization and maximization – Force #6 of Tony’s 7 Forces of Business Mastery — is all about going back to the core processes of your business. Don’t try to reinvent the wheel – do your best to polish the basics. This often-overlooked strategy is also one of the most important opportunities for you to find the sustainable, geometric growth that exists within your organization. And when you mobilize your team to focus on the biggest areas of improvement and create and implement a clear plan, the results can be astounding. Take Laurence Hallier, a serial entrepreneur who has founded and led numerous companies through years of explosive growth. Through Hallier Properties, he developed and delivered over $1 billion in real estate projects in the 2000s, including the Panorama Towers with 1,000+ luxury high-rise condos in Las Vegas and The Royalton at River Oaks, a 33-story luxury condo conversion. He then went on to found Show Media, the top provider of digital interactive advertising screens in taxicabs, reaching 100 million passengers each year. His company has been featured three times on the Inc. 500 Fastest Growing Companies in America. High achievers have clarity of vision — they attack their goals and are committed to preparing for “the game.” A champion studies the strengths and weaknesses of the competition, then develops a game plan that leverages his or her own skills and expertise to bring about the desired outcomes. They recognize the power of their specific skill set and execute these skills when it matters most. Having the mindset of a champion also requires effective leadership skills. You must develop a mission or purpose that not only drives you, but inspires others as well. Stepping into that winning mindset – for yourself and for your team – is a must when trying to achieve explosive growth. To constantly optimize your business you must be completely focused and committed to the specific outcomes that will grow your business. What’s your vision for your brand? How can you bring that outcome to life? Opportunities for maximization can be found in almost every area of the business: lead generation, sales and prospecting, sales conversion, changes to your offers that lead to higher prices or additional upsells, etc. The key is to understand and document your company’s current processes and results in each of these areas, anticipate the biggest areas of challenge and then mobilize your team with a clear plan so you can target specific improvements that will have the most impact. Having this clarity of focus and actionable plan will enable you to continually improve and ultimately succeed. Use the post-game analysis to your advantage. You can’t manage what you don’t measure. Learn from your experience and results. Everyone fails sometimes, be it in a championship game or in business. Don’t be afraid of failure. Instead, evaluate your successes and failures, and in reliving the game, mentally prepare for the next challenge. • If you lost, how will you keep pushing your practices forward? • If you won, what factors contributed to your success? • What were the key decisions you made, for better or worse? • How will you maintain your strengths and build on your weaknesses? As a business leader, you know that high-performance organizations foster successful innovators, thanks to the alignment of several vital forces. Constant innovation, efficient business processes, powerful performance systems, and team competency and behavior all work in harmony inside the world’s top companies. Finally, agility is also essential. To become a constantly evolving organization, there must be flexibility at all levels. A business that succeeds is one that creates sustainable ways to grow over time. Explosive growth can be a game-changer for your business, but deliberately moving your brand forward through well-thought-out steps you can repeat will lead to greater success in the long run.